Our product range includes a wide range of hydraulic goods lift. 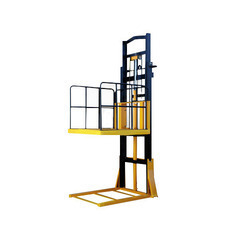 Our company has achieved laurels for offering Hydraulic Goods Lift to the clients. This product is quality approved by team of quality controllers after analyzing on numerous quality parameters. Hydraulic Goods Lift is offered in various specifications as per customer’s application requirements by the clients. Looking for Material Handling Equipment ?